This is the official mission logo. Click on the image to download an encapsuled postscript file from our public ftp site, it's called blast94.eps (a compressed version is also available). The goal of this expedition was twofold: first we intended to use a gas chromatograph / mass spectrometer (GC/MS) combination and tried to find out how reliable such an instrument can be out at sea. Secondly, the main purpose then was to measure methyl bromide (CH3Br) in the marine air and the surface waters of the East Pacific Ocean and to determine whether the ocean is a source or a sink for this compound. Along with methyl bromide, we determined about 20 other compounds in both air and surface waters. The expedition started in Seattle, WA, crossed several regions of the East Pacific and reached the inland passage of Chile at 41°S, and finally Punta Arenas, Chile, at 54°S about 4.5 weeks after its beginning. Surface waters along a cruise track in the East Pacific ocean were undersaturated in methyl bromide (CH3Br) in most areas except for coastal and upwelling regions, with saturation anomalies ranging from +100% in coastal waters to -50% in open ocean areas, representing a regionally weighted mean of -16 (-13 to -20) percent. The partial lifetime of atmospheric CH3Br with respect to calculated oceanic degradation along this cruise track is 3.0 (2.9 to 3.6) years. The global, mean dry mole fraction of CH3Br in the atmosphere was 9.8±0.6 parts per trillion (ppt) with an interhemispheric ratio of 1.31±0.08. These data indicate that ~8 percent (0.2 ppt) of the observed interhemispheric difference in atmospheric CH3Br could be attributed to an uneven global distribution of oceanic sources and sinks. 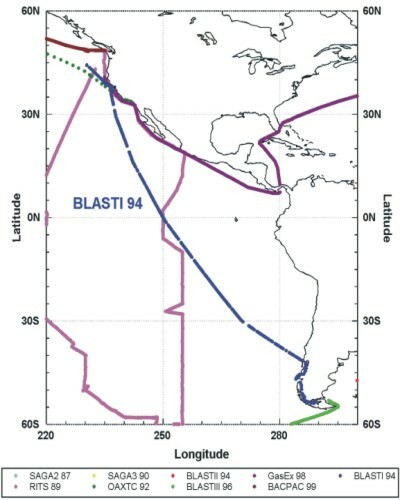 BLAST 94 is shown in blue through the East Pacific Ocean, out of Seattle, Washington into Punta Arenas, Chile. BLAST 94: Bromine Latitudinal Air/Sea Transect 1994: Report on oceanic measurements of methyl bromide and other compounds. J.M. Lobert, J.H. Butler, L.S. Geller, S.A. Yvon, S.A. Montzka, R.C. Myers, A.D. Clarke, and J.W. Elkins. NOAA Technical Memorandum ERL CMDL-10 (1996). Geophys. Res. Lett., 24, 675-678 (1997). Implications of methyl bromide supersaturations in the temperate North Atlantic Ocean, D.B. King, J.H. Butler, S.A. Montzka, S.A. Yvon-Lewis, and J.W. Elkins, J. Geophys. Res., 105, 19,763-19,769 (2000). Data are available on our anonymous FTP account ftp.cmdl.noaa.gov, subdir /hats/ocean/blast_94. Click GRAPH to see an on-line graph of results from the Science paper.